While the main thrust of this story is about forecasts for 2016, we’d like to prep you up for a few words of wisdom from globally accepted investment guru – Warren Buffet. Do you want to be smarter with your money and better at building wealth next year than you were this year? There’s no one better to turn to for advice than Warren Buffett. The Oracle of Omaha has built his own personal fortune to more than $72 billion, making him the third richest person in the world. Not only that, he’s offered a lot of common-sense advice on building wealth that absolutely anyone can follow, whether they know anything about investing or not. losing money is a good idea. But get beyond that obviousness, and this is practical advice that is very wise: avoid risk whenever you can. In particular, he says, to be happy and successful, never risk something you need to get something you just want--even if the odds are a thousand to one in your favor. With this rule in mind, Buffett himself has refrained from making many risky investments over the years, and passed up what could have been big gains, for instance in technology. Over time, though, this risk-averse strategy has paid off spectacularly well. 2. Get high value at a low price. “Price is what you pay, value is what you get,” Buffett has written to Berkshire Hathaway shareholders. So you can lose money (and violate Rule No. 1) if you wind up paying more for something than its value is worth. This can happen, for example, when you use a credit card and wind up adding a lot of interest to the price of what you've bought. Or when you buy anything--from a share of stock to a piece of real estate--when everyone else is buying and the market is overpriced. 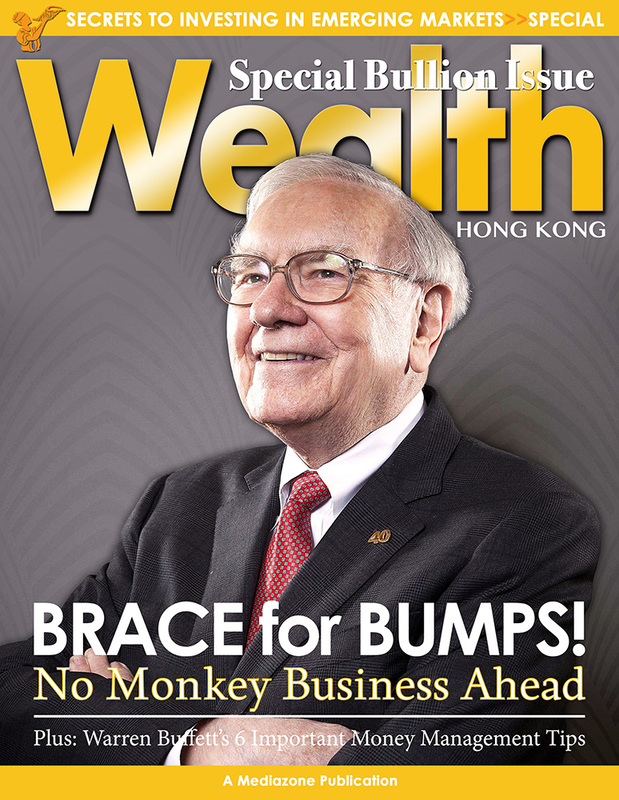 “Whether we’re talking about socks or stocks, I like buying quality merchandise when it is marked down,” Buffett wrote. It’s a wise approach. 3. Get into healthy financial habits. We all have habits we’d like to break, and others we’d like to form. 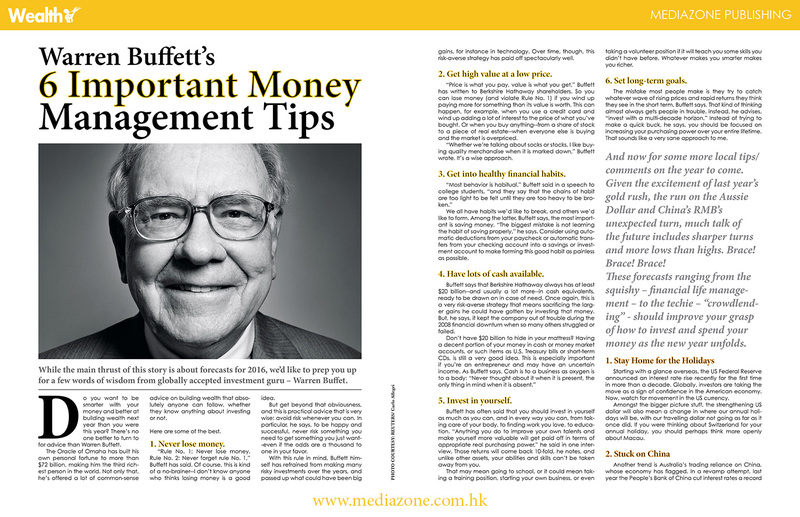 Among the latter, Buffett says, the most important is saving money. “The biggest mistake is not learning the habit of saving properly,” he says. Consider using automatic deductions from your paycheck or automatic transfers from your checking account into a savings or investment account to make forming this good habit as painless as possible. 4. Have lots of cash available. Buffett says that Berkshire Hathaway always has at least $20 billion--and usually a lot more--in cash equivalents, ready to be drawn on in case of need. Once again, this is a very risk-averse strategy that means sacrificing the larger gains he could have gotten by investing that money. But, he says, it kept the company out of trouble during the 2008 financial downturn when so many others struggled or failed. Buffett has often said that you should invest in yourself as much as you can, and in every way you can, from taking care of your body, to finding work you love, to education. “Anything you do to improve your own talents and make yourself more valuable will get paid off in terms of appropriate real purchasing power,” he said in one interview. Those returns will come back 10-fold, he notes, and unlike other assets, your abilities and skills can't be taken away from you. That may mean going to school, or it could mean taking a training position, starting your own business, or even taking a volunteer position if it will teach you some skills you didn't have before. Whatever makes you smarter makes you richer. The mistake most people make is they try to catch whatever wave of rising prices and rapid returns they think they see in the short term, Buffett says. That kind of thinking almost always gets people in trouble. Instead, he advises, “invest with a multi-decade horizon.” Instead of trying to make a quick buck, he says, you should be focused on increasing your purchasing power over your entire lifetime. That sounds like a very sane approach to me. And now for some more local tips/comments on the year to come. Given the excitement of last year’s gold rush, the run on the Aussie Dollar and China’s RMB’s unexpected turn, much talk of the future includes sharper turns and more lows than highs. Brace! Brace! Brace! These forecasts ranging from the squishy – financial life management – to the techie – “crowdlending” - should improve your grasp of how to invest and spend your money as the new year unfolds. Starting with a glance overseas, the US Federal Reserve announced an interest rate rise recently for the first time in more than a decade. Globally, investors are taking the move as a sign of confidence in the American economy. Now, watch for movement in the US currency. Amongst the bigger picture stuff, the strengthening US dollar will also mean a change in where our annual holidays will be, with our travelling dollar not going as far as it once did. If you were thinking about Switzerland for your annual holiday, you should perhaps think more openly about Macau. Another trend is Australia’s trading reliance on China, whose economy has flagged. In a revamp attempt, last year the People’s Bank of China cut interest rates a record sixth time. Now, while the outlook for China may not be plain sailing, the nation is still achieving growth at a rate of just under 7 per cent. Meanwhile, on the takeover front plenty more disruption lies ahead. Equities research analyst Dr Peter Mavromatis said recently that activity in the mergers and acquisitions field has reached its highest peak since the global financial crisis. Some takeovers of giants including iiNet and Toll Holdings happened last year. Other high-profile battles are still playing out, Mavromatis says, citing the logistics firm Asciano. The relevant, related sharemarket investment trend is diversification into “alpha-producing strategies”, especially takeovers, to complement your portfolio’s core elements, says Mavromatis, chief investment officer at the diversified financial services firm Beulah Capital. Taking the alpha path now is vital because the market’s performance has been flat for some time, he says. Mobile payments systems, online market places, logistics and biotechnology are promising growth areas, he says – just remember to judge every company on its merits. Wealth foresees a continued shift from actively managed funds to passively managed portfolios, as investors recognise the low and sliding odds that active management will outdo the index. Most active fund managers cannot match index returns after accounting for their fees. The trend will continue this year. In line, exchange traded funds (ETFs) will thrive because of advantages including low cost and diversification, says Brycki, the chief executive of the automated financial advice firm Stockspot. In fact, he says, ETFs under management are set to grow from $20.8 billion in December 2015 to more than $33 billion before 2016 ends. Another slick, widely tipped trend, is peer-to-peer (P2P) lending. Also called “crowd-lending”, P2P differs radically from the traditional bank loan model – the virtual platform just acts as a mechanism for matching borrowers with investors, charging a fee for the service. Kingdom after the global financial crisis, P2P offers funding solutions that traditional banks tied to residential mortgages cannot deliver because of regulation. “2016 will be remembered as the year commercial P2P lending came of age and disrupted traditional business lending,” Yannarakis says, tagging yearly returns at about 10 per cent. According to a survey of industry voices conducted by the money hub Lending Memo, the range lies between 5 per cent and 12 per cent. However, it is important to remember that P2P loans are tied to an individual, meaning the risk of default is theoretically higher. The Reserve Bank of Australia cash rate is pegged at just 2 per cent. Consequently, returns from fixed-interest asset classes have plunged, but low interest rates look set to continue, says certified financial planner Charles Badenach. So, factoring in inflation at up to 3 per cent, investors shopping around for higher yield may start taking needless risks with their portfolio’s defensive segment – the cash and fixed-interest bits, where returns and volatility are traditionally lower. Investors had better tread carefully because even that supposed safe bet, direct property investment, is weakly regulated and unpredictable, Badenach says. When pondering a purchase, says the Commonwealth Bank, avoid becoming emotionally involved – grasp that real estate should generate revenue like any investment. Psychology pundit Ray Jaramis, the financial life manager for the wealth management firm Treysta, has a softer take on the future. Jaramis says the big shift will be towards the provision of financial life management (FinLife): new-generation advice mixing behavioural finance with applied psychology and life coaching. Designed to boost financial literacy and offer more tools for achieving prosperity, the deep doctrine focuses on values-based guidance, instead of product and transactions, says Jaramis, the co-founder of the consultancy XY Adviser. “This approach could dramatically improve the financial literacy of a new generation and help individuals and families live a financial life that’s true to their values,” Jaramis says. If done well, he adds, it could drive positive societal change, curbing financial stress and slashing divorce rates. AMP Capital’s global head of property, Carmel Hourigan, says Australian real estate remains attractive. The income return alone is “very compelling”, Hourigan says. In step, demand – particularly from offshore investors – for high-quality property here is “insatiable”, she says. The Aussie dollar’s drop has just made property more enticing, she says. Commercial property represents the best bet, Hourigan says, because it offers a strong, consistent net income return of more than 5 per cent over the long term with capital appreciation. Residential property offers comparatively low income – say 2 per cent to 4 per cent – counting on capital markets to drive total return. In case you needed any more reasons to maximise your money, here’s another: the revenue pressure dogging governments across Australia means that serious taxation reform must be enacted, says wealth management strategist Allan McKeown. Superannuation concessions, including “transition to retirement” strategies and the ability to make large undeducted contributions, may be on the chopping block, warns McKeown, the chief executive of the wealth management group Prosperity Advisers. Capital gains tax exemptions, rollovers and concessions will also face scrutiny, he says, stating that change could come as soon as the May budget. The last forecast in this audit of trends and threats is the most alarming. If the warm water-caused wild weather trend called El Nino aggravates drought, the whole Australian economy will suffer, says the chief market analyst for the financial services firm CMC Markets, Ric Spooner. Agriculture comprises just 3 per cent of the economy, but a bad drought has a devastating impact on the sector’s output, Spooner says, branding the weather a potentially tremendous, persistent hindrance that can have rough economic flow-on effects. Household budgets will be pressured by rising food prices, he warns. All in all, we feel that best bet for investors is to keep at least 50% of your cash liquid and wait out for more clear signs. Keep watching and wait for your moment to strike. Central banks aren’t the only ones buying gold. We see massive demand figures from the consumer side as well. This is contrary to what we were told back in 2013; that consumers’ demand will diminish very soon due to low prices. For instance, look at India. Gold demand in the country remains solid. In August of 2015, $4.95 billion worth of gold was imported into the country. In the same period a year ago, this figure was just $2.06 billion. This represents an increase of 140% year-over- year. (Source: India’s Ministry of Commerce & Industry, last accessed September 28, 2015.) Don’t be shocked if gold buying in India continues in 2016 at a very similar pace. Don’t overlook gold’s demand out of China, either. To provide some perspective; in the second quarter of 2015 alone, the country consumed 216.5 tonnes of gold. Sales figures at mints around the world are solid as well. Year-to-date, the U.S. Mint has sold 658,000 ounces of gold bullion in American Eagle coins. (Source: U.S. Mint, last accessed September 28, 2015.) If this pace continues, in 2015, the U.S. Mint could sell the highest amount of gold since 2011 when gold prices were hitting all-time highs. Other mints like the U.K’s Royal Mint, and Australia’s Perth Mint have said that their demand is running high. Will the Shortage Continue in 2016? There’s something else. 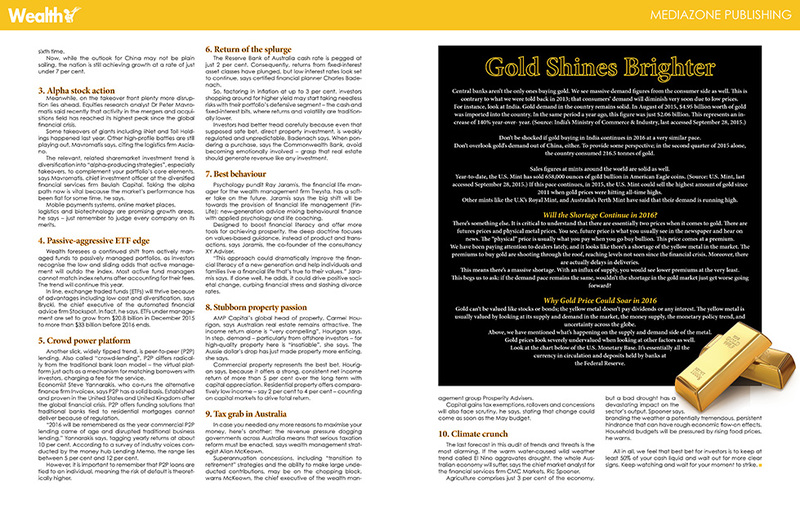 It is critical to understand that there are essentially two prices when it comes to gold. There are futures prices and physical metal prices. You see, future price is what you usually see in the newspaper and hear on news. The “physical” price is usually what you pay when you go buy bullion. This price comes at a premium. We have been paying attention to dealers lately, and it looks like there’s a shortage of the yellow metal in the market. The premiums to buy gold are shooting through the roof, reaching levels not seen since the financial crisis. Moreover, there are actually delays in deliveries. This means there’s a massive shortage. With an influx of supply, you would see lower premiums at the very least. This begs us to ask: if the demand pace remains the same, wouldn’t the shortage in the gold market just get worse going forward? Gold can’t be valued like stocks or bonds; the yellow metal doesn’t pay dividends or any interest. The yellow metal is usually valued by looking at its supply and demand in the market, the money supply, the monetary policy trend, and uncertainty across the globe. Above, we have mentioned what’s happening on the supply and demand side of the metal. Gold prices look severely undervalued when looking at other factors as well. Look at the chart below of the U.S. Monetary Base. It’s essentially all the currency in circulation and deposits held by banks at the Federal Reserve. AMG is onto a winning formula. In the cutthroat financial services industry where many competitors struggle to reach their decennials, AMG Financial Group has gone from strength to strength. The group offers consultancy, realty, and financial services around its core business of personal wealth management, to a discerning clientele of professionals and high-net-worth individuals in the market. The secret to its success? We find out. “AMG Financial Group was founded with the aim of raising the standard of service offered to clients and that remains the tenet that guides us today,” says Arnold Yeung, Founder, Chairman and CEO of the AMG Financial Group. “We have built our business with referrals from satisfied customers and their loyalty stems from the personal care and attention we devote to them. According to Yeung, the success or failure of a financial advisory firm depends on the talent of its financial advisors and that’s why the commitment to support the advisory team is so important. An indomitable man, he faced the challenge head on by cultivating a highly motivational work environment for his team. “Our every triumph can be attributed to our team, who turn vision into reality at the frontline. Their personal and professional development is a key priority and we invest a great deal of time and resources to give them the support they need. We offer regular market updates, investment and product training, marketing and brand support. This reflects our commitment to recruiting, training, and retaining an advisory team of the highest caliber,” says Yeung. In 2013, with an aim to foster more financial talents, AMG is offering its “AMG Financial Group Scholarship” to more universities in Hong Kong. "Setting unrealistic standards is a common mistake amongst financial advisor - one we were keen to avoid from the very beginning. By getting to know our clients personally, we gain a thorough understanding of what they hope to achieve with our help. But it doesn’t end there. Financial decisions are often difficult to make and have a far-reaching impact on the lives of the individuals concerned and their families, so we don’t take them lightly. Following the first meeting, we work with clients to ensure initial goals have not changed upon further reflection and create a plan to help them achieve the future they envision for themselves. At an early stage, inconsistencies are uncovered and addressed. Clients appreciate this meticulous approach, as it is clear to them that we are a company that truly cares. 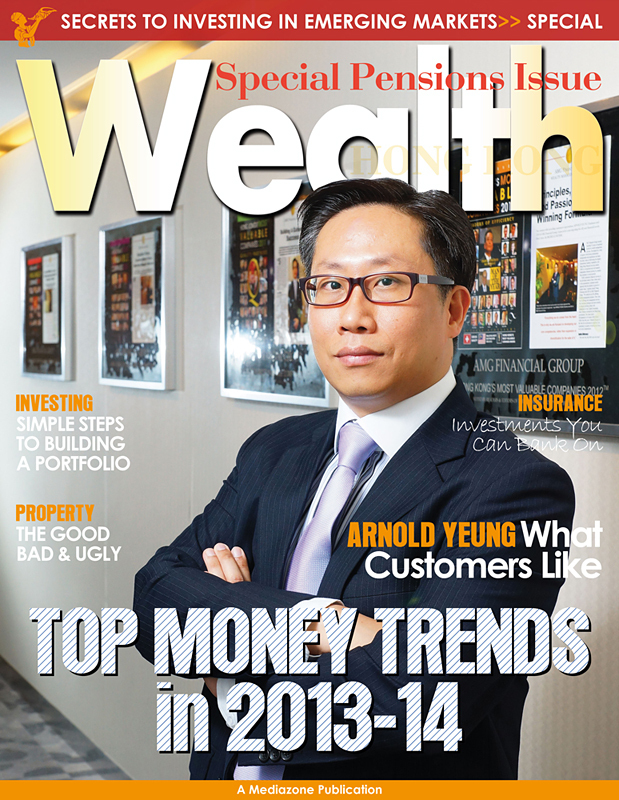 This is evident in the excellent persistency rate we are proud to have sustained, and this also lead us to win the BENCHMARK magazine “Financial Planning Process Award” again this year,” says Yeung. 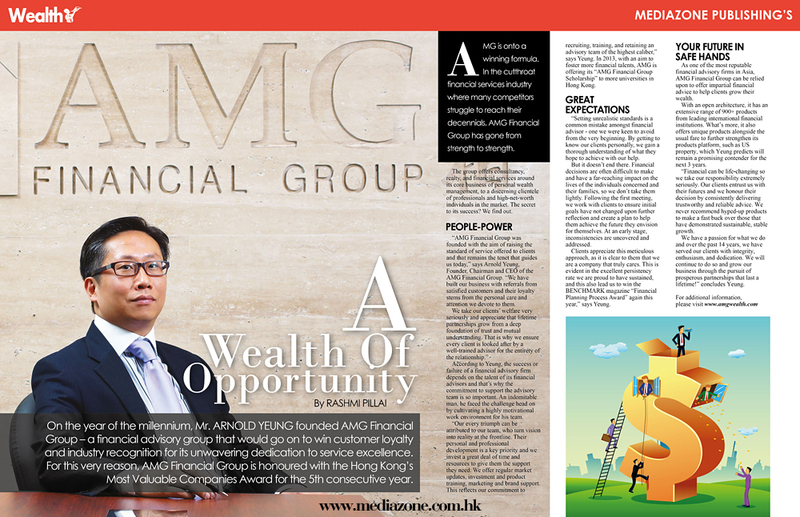 As one of the most reputable financial advisory firms in Asia, AMG Financial Group can be relied upon to offer impartial financial advice to help clients grow their wealth. With an open architecture, it has an extensive range of 900+ products from leading internationalfinancial institutions. What’s more, it also offers unique products alongside the usual fare to further strengthen its products platform, such as US property, which Yeung predicts will remain a promising contender for the next 3 years. “Financial can be life-changing so we take our responsibility extremely seriously. Our clients entrust us with their futures and we honour their decision by consistently delivering trustworthy and reliable advice. We never recommend hyped-up products to make a fast buck over those that have demonstrated sustainable, stable growth. We have a passion for what we do and over the past 14 years, we have served our clients with integrity, enthusiasm, and dedication. We will continue to do so and grow our business through the pursuit of prosperous partnerships that last a lifetime!” concludes Yeung.